1)COMBINE all cheese stuffing ingredients in a mixing bowl. 2)BUTTERFLY thickest section of chicken breasts to create 2 lobes. Pound each breast between 2 sheets of plastic wrap until ¼” - ½” thick. 3)PLACE flattened chicken breasts on a plate and place desired amount of stuffing on one lobe of each chicken breast. Gently press stuffing down so it resembles a hockey puck. 4)FOLD over other lobe of chicken breast; does not have to seal. 5)HEAT large sauté pan over medium heat. 6)ADD olive oil and heat until shimmering. 7)PLACE flour in a shallow pan and season to taste with salt and pepper. 8)DREDGE stuffed chicken breasts in flour, shaking off excess. 9)SAUTE chicken breasts with preheated oil, cooking until each side is golden brown. 10)REMOVE chicken from pan and place in a baking dish. 11)BAKE for 10-20 minutes, or until juices run clean and center of chicken reaches 165°F. 12)ADD onions to sauté pan, and stir to loosen chicken drippings. After 2 minutes, add mushrooms and sauté until onions are translucent. 13) DEGLAZE pan with Marsala wine – make sure to incorporate drippings from bottom of pan. 14) HEAT wine to a simmer and add heavy cream. Simmer on low heat until reduced by half. 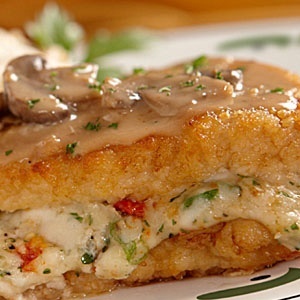 15) PLACE cooked chicken breasts on a plate and top each with onions, mushrooms and sauce. 16) SERVE with your favorite garlic mashed potato recipe.